A Palestinian wool-washer of the third century, of whose scholarly attainments, if he had any, nothing is recorded, but whose piety and honesty afforded the haggadists opportunities for legends and religious speculations. He is said to have been born on the day of a certain Rabbi Abun's death; and, with reference to this circumstance, R. Abba b. Kahana observes: "What particular wisdom is shown in Solomon's saying (Eccl. i. 5), 'The sun rises, and the sun sets.' Do we not see the alternation of light and darkness daily? The saying refers to a peculiarity in the history of Israel; namely, that there is never a vacancy in the line of pious men: the sun of one saint rises before the sun of another sets. Thus . . . before Rabbi Abun died, Abba Hoshaya had been born" (Gen. R. lviii. 2; Eccl. R. i. 5. Compare Zunz, "G. V.," 2d ed., 185; "Bet Talmud," iv. 12-14). It is related that Abba Hoshaya once found some jewels which a Roman princess had lost. He brought them to her, but she would not accept them, remarking that she did not value them much, and that they belonged to him byright (compare B. M. 28b). 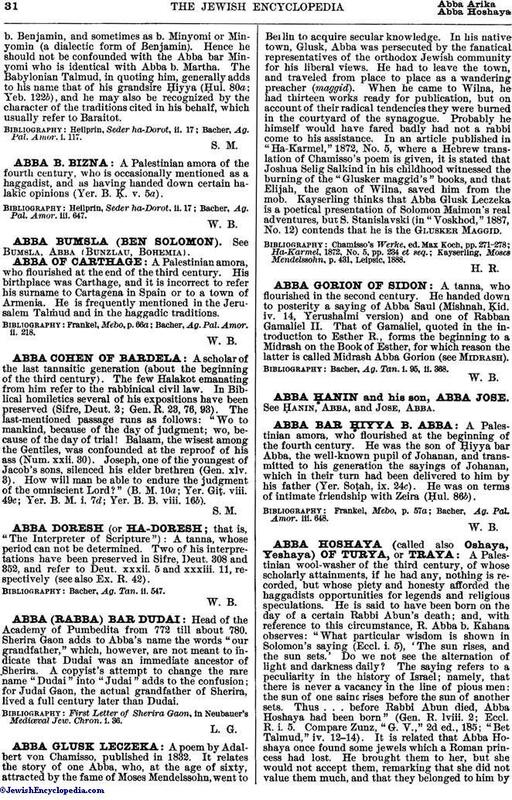 Abba replied that the Jewish Law orders the restoration to its owner of anything found; whereupon the princess exclaimed, "Praised be the God of the Jews!" (Yer. B. M. ii. 8c; compare "Pene Mosheh.") Therefore, at his funeral, the Scriptural verse (Cant. viii. 7), "If a man would give all the substance of his house for love, it would utterly be contemned," was applied to Abba Hoshaya's love of God (Lev. R. 30, Cant. 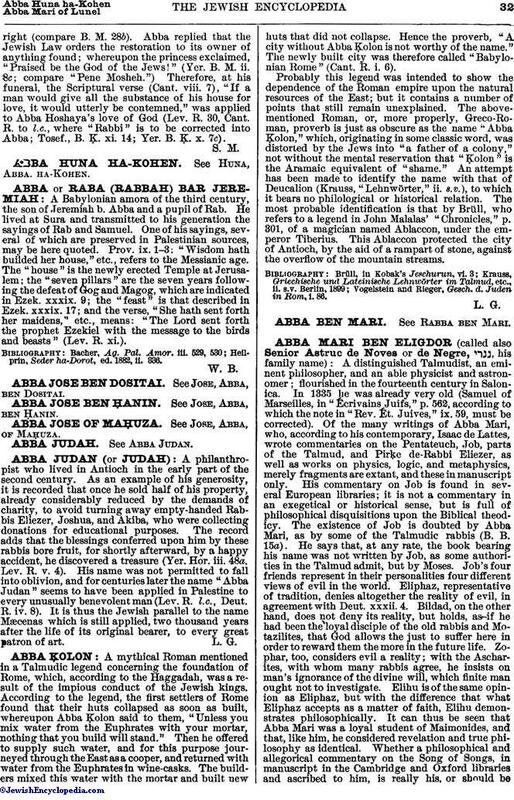 R. to l.c., where "Rabbi" is to be corrected into Abba; Tosef., B. Ḳ. xi. 14; Yer. B. Ḳ. x. 7c).